UWTVA Director Lisa Laflin (left) presents the Gary A. Lagrange Community Impact Award to Shannon Smith (right). 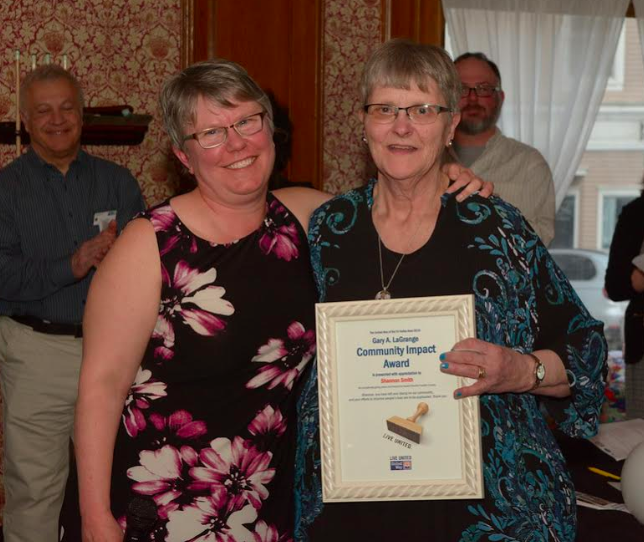 KINGFIELD - The Herbert Grand Hotel buzzed Thursday night as community members and business representatives gathered for the United Way of the Tri-Valley Area annual meeting. The evening celebrated the support of individuals and businesses who helped with another impactful year for the UWTVA, specifically highlighting several people who went above and beyond. Chair of the board Peter Smith told the crowd that the non-profit logged $250,000 worth of volunteer hours within the 2018 year. "We are very rich with people who want to give back," he said. One such person, who UWTVA Director Lisa Laflin said has left her stamp on the community, is Wilton resident and Blueberry Fest organizer, Shannon Smith. "She consistently shows great leadership but excels at getting others involved. Western Maine would be a very different place without Shannon Smith," the program read. Smith was presented with the Gary A. LaGrange Community Impact Award and applauded the help from others that make her job easier. "I love knowing that I can pick up that phone and hear a yes," she said. The evening included a number of awards, all sticking with the "Spring into Action" theme, such as the "Master Gardener" award for businesses going above and beyond in their support of UWTVA (Barclays, Hannaford, Franklin Community Health Network, LEAP, Robin's Flower Pot, United Insurance and Verso). Winners of the Community Change Challenge were also recognized with trophies for their efforts, Verso Paper, in Tier I raised more than $3,000 and Spruce Mountain Elementary School in Tier II raised more than $1,500. The 21 businesses that participated raised more than $6,800 in change. The winning organization in each tier have the option to designate 25 percent of the raised funds to a United Way Partner of their choice. Congratulations Shannon, well deserved and I am very pleased that your dedication to the community has been recognized! ...Congratulations Shannon Smith ...You are a real Winner ! Well deserved Shannon, thank you for all you do for our overall community!